This was the first Cabernet Sauvignon that we made for ourselves in 6 years. The source of the fruit is Dry Creek Vineyard located on the winery property. The resultant wine is designated “Estate Bottled”. However, bottling never occurred. Why not? We had the opportunity to sell all of this 2009 wine while it was still in barrel, and we did just that! The opportunity was too good to pass up – given the vagaries of wine markets. 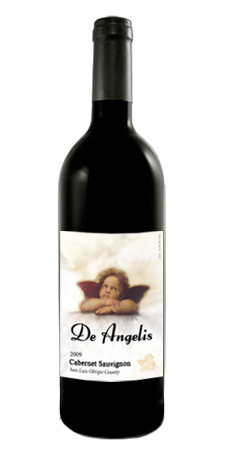 This may be one of the best Cabernet Sauvignon De Angelis Wines has ever made! De Angelis Wine, bottled the 2010 Cab in mid-May 2012. We released it on January 1, 2013. We developed this Cabernet Sauvignon from Cabernet Sauvignon fruit farmed at the Dry Creek Vineyard in Paso Robles, CA. It is Cabernet Sauvignon blended with small amounts of estate Merlot, and non – estate Cabernet Franc. We carried out two separate fermentations. One with yeast that promotes jam, cedar and mild spiciness flavors. A second fermentation with another yeast yielded intense foremouth volume, mid-palate and fresh after taste. The resultant wine is a 14.1% classic Cabernet, that exhibits wonderful fruit both on the nose and in the mouth, a terrific mouthfeel, spice, and a long finish. We aged this wine in both Hungarian and French oak barrels for 18 months. Twenty five percent of the barrels were re-coopered and re-toasted to our specifications. De Angelis Wines does not enjoy heavy oak flavors. Consequently, we selected the remaining barrels to provide only modest oak flavors. From the time this wine was in barrel, it was clear that this wine would be a very fine representation of a Cabernet Sauvignon. We bottled in May of 2012, and aged the wine in bottle for eight additional months. It was worth the wait! This 2011 Cabernet Sauvignon was developed predominantly from Estate fruit from the Dry Creek Vineyard in Paso Robles, CA. It is Cabernet Sauvignon blended with small amounts of Dry Creek Estate Merlot, and non – estate Cabernet Franc. Two separate fermentations were carried out to completion. One with yeast that promotes jam, cedar and mild spiciness flavors, and another that promotes intense foremouth volume, mid-palate and fresh after taste. Following fermentation, we pressed two lots , combined them, and barreled. The resultant wine is a 13.1% classic Cabernet. It exhibits wonderful fruit both on the nose and in the mouth, a terrific mouthfeel, spice, and a long finish. This wine was aged in both Hungarian and French oak barrels for 18 months De Angelis Wines does not enjoy heavy oak flavors. Consequently, the barrels used to age the wine were selected to provide only modest oak flavors. 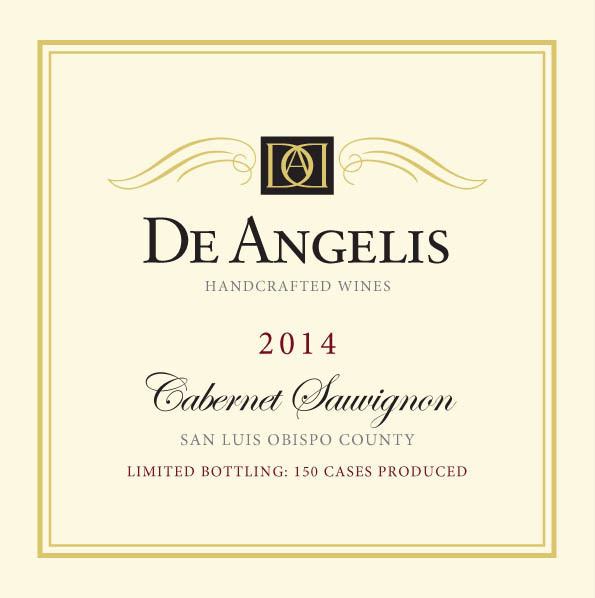 De Angelis Wine bottled this Cabernet in mid-June 2013 and released the wine on September 1, 2014. It is clear that this wine is another very fine representation of a California Central Coast Cabernet Sauvignon. The sensory qualities include blackberry, stone fruit and caramel. The finish is long and the mouthfeel elegant, and very smooth. In spite of a very difficult weather in 2011 – rain, freeze and rain again – all of our 2011 wines are among the best we have ever made. One cannot go wrong with a selection of our Red wines from 2009, 2010 and 2011. Try a three-pack and see for yourselves. 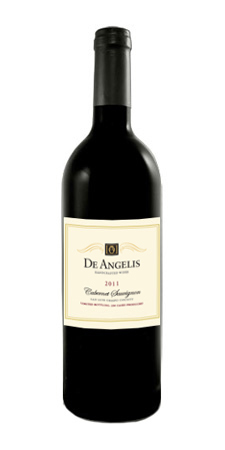 De Angelis Wines released this wine in September of 2014. This 2013 Cabernet Sauvignon was developed by and large from Estate fruit from the Dry Creek Vineyard in Paso Robles, CA. It is Cabernet Sauvignon blended with small amounts of Dry Creek Estate Merlot, and non – estate Cabernet Franc. Only the Cabernet Franc is not estate fruit. As is our practice, two separate fermentations were carried out to completion. One with yeast that promotes jam, cedar and mild spiciness flavors, and another that promotes intense foremouth volume, mid-palate and fresh after taste. Following fermentation, these two lots were pressed, then combined, and barreled. The resultant alcohol in the wine is 13.6 % — a classic Cabernet that exhibits wonderful fruit both on the nose and in the mouth, a terrific mouthfeel, spice, and a long finish. This wine was aged in both Hungarian and French oak barrels for 30 months, and allowed to develop slowly. De Angelis Wines does not enjoy heavy oak flavors. Consequently, the barrels used to age the wine were selected to provide only modest oak flavors. This De Angelis Wine, was bottled in mid-June 2015 shall be released on or before September 15, 2018. From the time this wine was in barrel, it was clear that this wine would be another very fine representation of a Cabernet Sauvignon. The sensory qualities that we taste include blackberry, stone fruit and caramel. The finish is long, and the mouthfeel elegant – very smooth, but not terribly tannic. In spite of a very sometimes difficult weather in 2013, our 2013 wines are among some of the best we have made.